With the ever evolving world order, the mechanics of practice of medicine too have changed. Earlier the catheter (hic… Cardiologist) was moving from one hospital to the other, but now the epithet—‘The Roving Scalpel’ (hic… Cardiac Surgeon) seems more apt and infact ubiquitous. 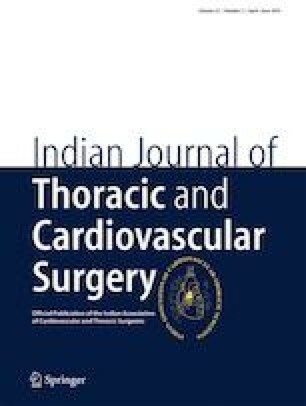 Dwindling volumes as a result of onset of percutaneous interventions, both for coronaries and valves, as also a large number of mergers and acquisitions with new strategies based on networking of multiple low-volume centres, and they being serviced by a single team, have opened up new vistas. The dissemination of off-pump coronary artery bypass graft (CABG) seems to have added fuel to this, notwithstanding the fact that elaborate open heart surgery paraphernalia may not be even present in a centre, where these surgeries are being performed. Does this affect the patient care? What if a patient crashes and needs cardiopulmonary bypass support? What if a surgeon is involved in a major operation, just as when he is required for a previously operated patient in another institution? A recent study by Shroyer et al. looks at just this scenario which now seems to be common-place in India. They use the Society of Thoracic Surgeons (STS) Adult Cardiac Surgery Data base for 543,403 CABG procedures performed between 2011 and 2014 spread across 1120 centres and involving 2676 cardiac surgeons. Nearly one fourth of the surgeons were operating at multiple centres and their observed-to-expected mortality ratios were higher than single centre surgeons (1.06 vs 0.97, p < 0.001). When data for multi-centre surgeon was further sub-analysed, the observed-to-expected mortality ratio was higher for surgeries performed at the satellite centre versus the primary operating facility (1.17 vs 1.01; p < 0.001). Compared with single centre surgeons, multi-centre surgeons had higher mortality rate (1.7 vs 1.6%, p < 0.001) and a higher major adverse complication rates (11.9 vs 10.5%; p < 0.0001). As more and more centres with tertiary care facilities are burgeoning in tier two and three cities, with very limited supply of the tertiary care human resources, this issue assumes paramount importance in our country. For the sake of economic expediency, a lot of corporate groups maintain one single team, which is made to rotate on daily basis by a rota to various satellite centres in a ‘wheel and spoke’ model of delivery of health care. This has found favours with both the health care providers as also the patients, who get delivery of tertiary health care services at their door steps. However, is this trend benign or does this compromise the interests of the patients? My take—no and yes respectively. There has been a debate on the volume-outcome relationship of most cardiac procedures, but more specifically CABG and conflicting reports are available in the literature, with Duke database  showing no such relationship and New York database  showing a strong association. Looking at the Californian database , Dr. Carey noticed, ‘high volume surgeons performing CABG procedures at a single high volume hospital had the very best risk-adjusted outcomes. High volume surgeons performing CABG at multiple hospitals had a higher risk-adjusted mortality than high volume surgeons operating at a single hospital. A heart surgeon who operated occasionally at multiple hospitals, had worse outcomes’. This therefore raises a major question as to is it ethically justified for a surgeon to be operating at multiple centres and is this legally tenable, should it be a cause for a litigation? This certainly calls for a national debate and proper policy guidelines as to what is that crucial volume below which the surgeon should not indulge in multi-centre practice. It requires no rocket science to intuit that an anecdotal surgery performed with a totally new operating team, in an alien environment, has a potential to be detrimental to the patient’s interests. Simultaneously, we must also define that in case multi-centre practice is allowed, what is the level of in-house expertise that must be available round the clock for patient care, because the primary surgeon will theoretically not be available, if he is operating at the same time at another institution, when an acute emergency develops in the first institution. We all know, up to 2–3% of patients following CABG may need to be taken back to the operating theatre for acute bleeding and at times, peri-operative ischaemia may call for graft revision. Unless we lay specific guidelines and self-legislate and regulate, these issues may bring more sorrow to the profession, as then we will be dictated by the regulators, administrators and the legal authorities. So, it’s time that we mend our house our self and lay down specific guidelines, on this rather an emotive and a sensitive issue, which may even be disruptive for more than a few.